Discussion in 'Star Trek: Enterprise' started by briloop, Oct 12, 2017. Over a recent two-month period, I re-watched every episode of ENT. I think it was an underrated show that didn't deserve half the criticism it received. Vger23, Tenacity, Anders and 6 others like this. Well, you didn't lie when you said this topic was just a general comment. So are you now done, or do you wish to actually start a discussion? Infern0, oberth and Prax like this. Considering that he answered my question with an affirmative that he is in fact done, then it looks like any further conversation will have to be by the rest of us. Indeed, good topic. I'm just finishing season 2 and my interest is rekindling after an all-time low during the middle of the season. Looking forward to the third and fourth seasons about which I've heard lots of good things. Yep, I watched this show for the first time a couple years back (made a thread on here about it)... it was really good! I just couldn't understand so much of the dislike toward it. I watched it when it ran originally and liked it quite a bit, a few stinkers, but mostly enjoyed it alot. Have watched it again from start to finish on heros channel. Held up quite well. Some very good stories flushing things out. A shame show got cut short to 4 years. Kytee and XCV330 like this. Thanks for the welcome. No hard feelings. Every Star Trek series had its flaws. ENT had its share. I enjoyed watching it again. If there was one thing that should have been done differently, it would be fewer instances of the crew making dumb decisions, like the time when Trip and Reed got robbed on Risa. On the other hand, there were some good episodes, like “Carbon Creek”. the show gets way too much flak - thinking of it the 4th season (minus one totally stupid episode making use of a holodeck) is - in my book - the best season of all trek. i also don't understand why the augment arc is despised so bigly. i agree if the show would have been longer that season needed to be stretched into at least two, though as it is a bit dense. allk trek shows had their share of stinkers. as i do my binge reruns from dvd.s ripped to my media server* i skip them and that's it. 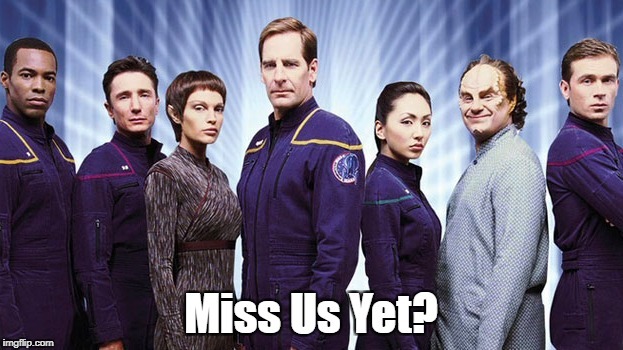 I should probably do a rewatch of ENT myself, seeing how it was my least favorite Trek series at the time. But it will be hard to get past what I judge to be the inherent frat-boy mentality the show often had. I've just started rewatching this series. I liked it before, and will again. But with an eye toward reviews and details, I have questions - let's call them general questions. First, anyone wise in the ways of the Klingon language have any idea what Klanng said to the farmer before the farmer (Moore) shot him with the plasma rifle? Just curious. Also I note it's lucky the plasma rifle wasn't in the 40-watt range or there would have been no story. And more importantly, why is Klanng even going toward Earth? He got the information at Rigel X, and Kronos is in the other direction from Earth, so why is he heading in that direction? What happened to the Suliban ship? Did it crash, too? Or did a third man just go home and report, their mission having failed? Or had they already captured Klanng and was taking him somewhere (past Earth) and he caused them to crash and then he escaped? That might work. And I greatly dislike the fact Kronos is apparently right on our doorstep. At warp 4.5 they are only 4 days away? That seems very wrong. Using the cube formula, NX-01 could travel about 91 light years in one year at warp 4.5, and it was established Kronos was within 90 light years of Earth - but 4 days? At warp 4.5, they should be able to only travel about 1 light year in 4 days. Sadly, to make this story work, I think they seriously over estimated a warp 5 engine's abilities to get them there in so short a period of time. IIRC, during the first season they were traveling outwards at about the right rate, getting almost 100 light years in the first year. Why sit in a starship for 4 lousy days when you can just beam there from earth. Transwarp beaming does seem to take a lot of the fun out of it. Well for one thing, in the Prime universe Scotty didn't think it up until the 2380's and in the new universe, Khan burned up the only working model and burned down the S31 facility holding the only copy of the research. Back to boring old warp speed it is. Since Scotty survived in that timeline, I can think of no reason why they wouldn't have many working units in short order. Realistically, it shouldn't even be something that Scotty has memorized in his head and can easily make work on the fly. He should have notebooks or padds full of formulae, notes, schematics, etc. But ST09 showed that he was able to make it happen just by plugging a formula from future-Spock into a regular transporter console. Those pesky formulas can be a real headache, let me tell you..
Yup, he said they "confiscated" everything so he couldn't replicate the effect. He can't remake it from memory. It was nice of the film to point that out and wipe out the remaining ability to create it.